Former Evile man Ol Drake is taking thrash to the limits with his new solo project Old Rake, and bringing some guests along for the ride, too. They say what doesn't kill you makes you stronger, but the reality is that it's never been more difficult to be a musician. Even bands that most of us would consider successful in their own right face the financial and logistical nightmare that is touring in the modern age. 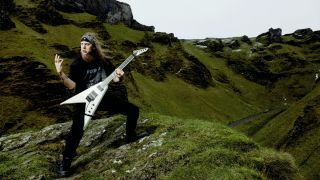 "Almost two years after leaving Evile, the bearded gunslinger has returned with his debut solo album"
It's something that Ol Drake - co-founder and ex-lead guitarist of British thrash mob Evile - knew all too well, having decided to quit the band he built with his brother Matt in August 2013. "We'd tour for ages and come home, then my priority would be writing the next album," says Ol. "So I was either on tour or writing music. Eventually, it took its toll and I realised I just couldn't do it any more. There were no hard feelings and everyone totally understood. I loved the playing bit, but all the time before and after..."
Almost two years later, the bearded gunslinger has returned with his debut solo album, mischievously titled Old Rake. It'd be fair to say the news came as a surprise, since Ol had decided to take a break from music. "I had to explain I was done with music for the time being. Eventually, the idea of the solo album came up and I figured if I was being given the opportunity, then why the hell not?" And the rest, as they say, was history. The first instalment in Ol's career as a solo artist is mind-boggling in ambition, with plenty of tongue-in-cheek humour - often a tough balance to get right. For a musician who's been synonymous with thrash metal for his entire career, Ol admits it was incredibly liberating to cast a wider net over the musical landscapes that make up his DNA. "If you're in a thrash band, you can end up just being limited to that style," says Ol. "And I mean no disrespect to Evile by saying that. It felt good to play in major keys and sound a bit cheesy! "I didn't consciously want to make an instrumental album, though. The intention was originally to have vocals, but they weren't really working, so I ended up making it 100 per cent guitar. I found my feet and it started taking off from there." In time, Ol found himself sat on a finished record that was mixed by death-metal legend James Murphy and featured the likes of Gary Holt (Slayer/Exodus), Josh Middleton (Sylosis) and myself. This writer met Oli through work on a metal magazine, where we jammed some Richie Kotzen and Greg Howe licks, and happily enough, this ended up with your scribe guesting on lead single Guitarists Playing Guitars. With hindsight, for Oli, it seemed as if all the pieces had just fallen into place. "I knew of James Murphy just from growing up on metal," he explains of the Exodus, Death and Testament guitarist. "Strangely enough, he commented on a story about me leaving Evile, saying that these kinds of things will happen more if people don't support music. So we got talking and he ended up mixing it! "As for Gary, we toured together in 2008. I mentioned I was working on this crazy solo album and it might even have been his idea to shred on it... I thought, 'Well, you can't say no to Gary Holt!' Josh is a great player, quite proggy in his own way, so I'm glad he said yes." Having recently been announced for this year's Bloodstock (the festival that coincidentally played a vital part in launching Evile's career), it's great to see the BC Rich-loving shred aficionado right back where he belongs.